Dropbox is great. It is a folder where you can drop your files and have them sync into the cloud securely and sync them with any computers you want. I primarily use this for syncing my MacOS keychains between my Mac Pro and Macbook Pro. This in combination with MobileMe ensures that almost everything is kept in sync between computers. While I do use Back to my Mac to access my files on the Mac Pro while I am away, I have found it to be somewhat unreliable. For no reason it will periodically become unavailable and will show an error that it cannot map the correct port. This is odd because there are no other machines that should use that port (4500) on the network (I will go over port mapping and IP reservations in another post). With that in mind and other potential issues which could cause my Mac Pro to be unavailable I set out to see if I could further leverage Dropbox. So not only did I want to sync my preferences and passwords, but project files as well. It probably isn’t feasible for me to back up everything but current projects should do. I have my projects folder located on the same drive as my Dropbox folder, which is 2 500gig drives in a software RAID mirror for redundancy (and my entire system is backed up to a Drobo). My folder structure was established prior to getting Dropbox and I sure don’t want to move things around now… plus that would mean that I would far exceed what my Dropbox account can handle. In comes symlinks (or Symbolic Links). Symlinks are much like Mac OS aliases with a few key differences. For instance, if you move the folder the symlink points to, your symlink will no longer work properly. And while symlinks are compatible with pretty much any UNIX operating system they don’t play nice with Classic (don’t know that this is really a problem for anyone these days). For our purposes symlinks are a perfect way to maintain our existing file structure and leverage Dropbox in the process. You could fire up Terminal and create symlinks the old fashioned way (more info here)…. or you could do what I did and install SymbolicLinker. 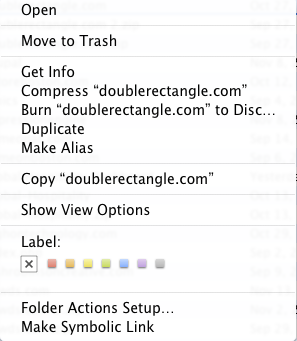 SymbolicLinker provides a nice system-wide way of quickly creating symbolic links via the context-menu in OSX. Just right-click (or control-click) the folder (works best with folders not individual files) then hit the option to create a symbolic link. This works and looks just like an alias in OSX. Just copy this over to your Dropbox folder and you are good to go! Do you ever get an error when shutting down your computer from Dropbox telling you that your Dropbox folder can no longer be found? I tried using Symlinks as well as just moving the folder via the Dropbox preferences, but it doesn’t seem to like being on a RAID drive. Works fine when logged in, but its annoying to see this warning on shutdown. Is your RAID created using the Disk Utility tools or something else like SoftRAID?